First and foremost, I am an LA Galaxy fan. But, it’s no secret that I have a crush on Jordan Morris, so I got these tickets for Seattle Sounders vs Minnesota United back in early February when he wasn’t injured. I planned my trip to visit my friends who actually live in Puyallup right now. My plan was to visit them and enjoy a city that represented the best of what Washington state has to offer, the only exception was the weather. After the game, we got oysters and wine, and went to Pike Place for clam chowder. It was a day to behold in downtown Seattle where it’s common to see people adorned in sports gear since the Seattle Mariners stadium is right there. Of course, the most common attire is the Seattle Seahawks, but the soccer culture there is one of the best in the league. CenturyLink is huge and I’m spoiled by StubHub Center where there’s not a bad seat in the house and I’m used to general admission where I can arrive early and be close to the players. So, I wanted to sit right by the tunnel. Being the soccer ambassador I am, I brought my friend Megan to her second MLS game ever. Her husband, who follows soccer since he’s from Jamaica, and their daughter also came along with us this time for their first game. I didn’t see JMO, but it was an exciting event and a game the Sounders needed to win since they were on the verge of the worst start in league history. Watching their three-year old’s reaction had to be one of our favorite parts of the match. She was clapping and really seemed stunned by the number of people. We took turns holding her and picking her up so she could see over the fans who never sat down. I was definitely overwhelmed by the energy and capacity of the soccer fans. During halftime, I went over to meet with fellow MLSFemale Official Reporter for the Sounders, Jennifer Denton, which as she put it, was finally nice to put a face to the name. I’ll be back up in Seattle in the Los Angeles Galaxy section in August. The typically rainy and gray city of Seattle shared its spring splendor of sunshine and crisp salt air this past Sunday, April 22nd, boasting blossoms from dogwood and magnolia trees along with the roar of sports fans in the distance. The Sounders did not disappoint either. They brought sunshine to the CenturyLink stadium winning 3-1 against Minnesota United. Doing so in style as they flaunted their Earth Day recycled uniforms. The thrill of the stadium doesn’t just stop at the aroma of garlic fries and the booming of fireworks. Fans are the driving force, chanting and singing from their seats while waving fan gear and flags. You feel as if Chief Seattle and his tribe are there in spirit. The players rush out to the field as youngsters line the guardrail in hopes of getting an autograph. In good company, surrounded by family and friends, I can say I feel like a real MLS fan, especially with this view 3 rows from the action. The few clouds in the sky start to part and the warmth of the sun starts to fill the stadium. Sloshing $9 beers in the stands as the Sounders bring in their first goal, delivered by midfielder Gustav Svensson. His teammate Will Bruin follows closely behind scoring back to back within minutes. It feels good to have your home team step up to the net, shoot, and score, there is no better way to feel the energy of almost 40,000 fans. With the ball making its way from player to player, the intensity builds as Christian Ramirez scores one for Minnesota United. It was a solid effort and good fight from both teams the entire 90 minutes. 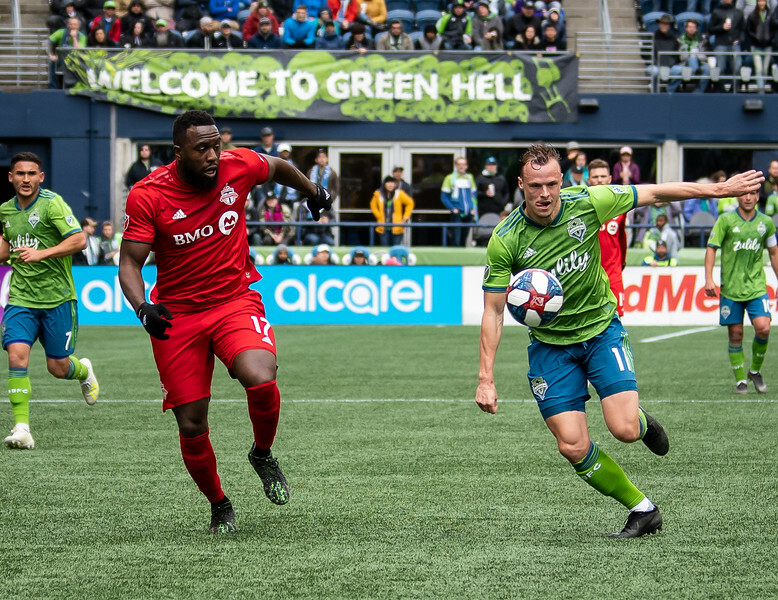 It was the last 5 minutes that put the Sounders over the top with Jordy Delem scoring in the final moments of the match. The sound of trumpets and drums filled the air as fans flooded out of the arena in good spirits, an outstanding first win of the season. The Seattle Sounders played a historic game Wednesday night. 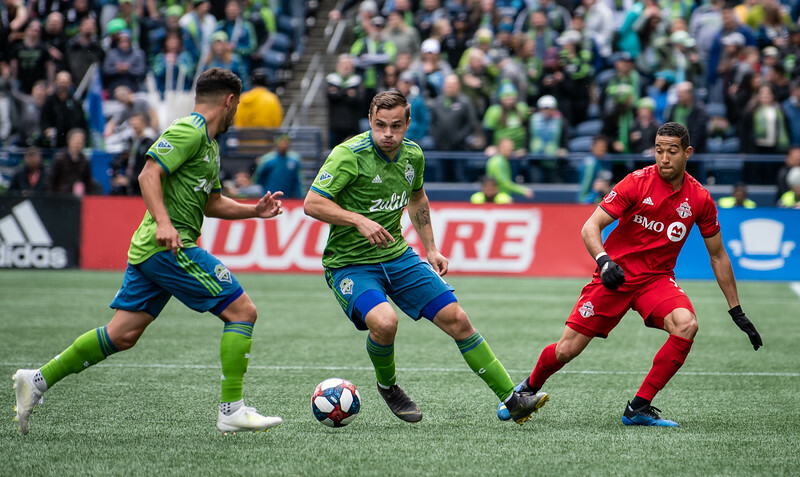 The game started out less than ideally for Seattle, but in the end, the Sounders became the first team in MLS League history to overcome a 3-0 deficit v DC United and win in regulation. *this was also the first Sounders game I’ve been able to go to in over a year. Coincidentally, the last game I went to was a Sounders 2-0 win over DC United in DC last year. DC United scored in the 8th minute on a goal by DeShorn Brown, then again in the 27th minute. 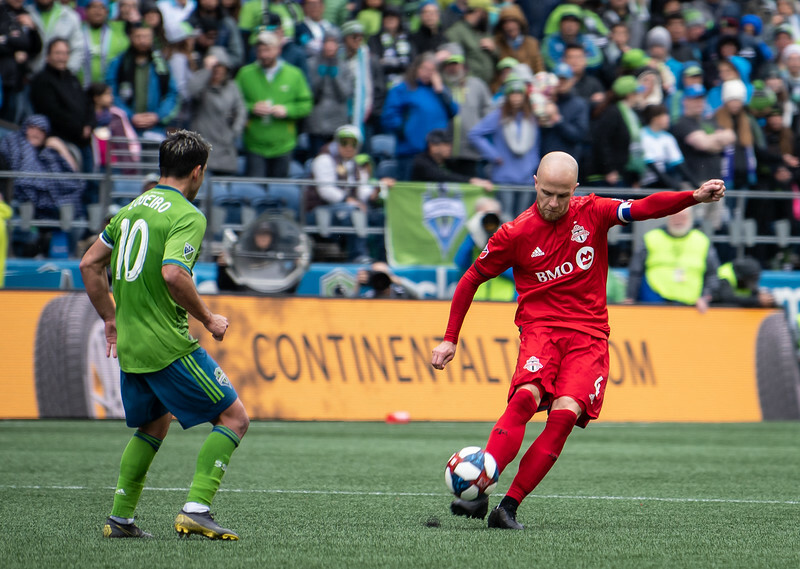 The Sounders were playing good soccer, but weren’t getting attacks off, and their defense and midfield had some weak spots dropping back. Five minutes into the second half, DC United sunk the Sounders ship a little more and made it a three goal deficit. But, Will Bruin and the mighty Sounders fought back, and in the 51st minute, Bruin made it a 2 goal deficit. Now CenturyLink Field was excited. Everyone knew that the Sounders could come back. 11 minutes later Brad Evans closed the gap a little bit more. Seattle still had 28 minutes to play and had all the momentum going. Gustav Svensson picked a great time for his first MLS goal and tied it at three in the 74th minute. 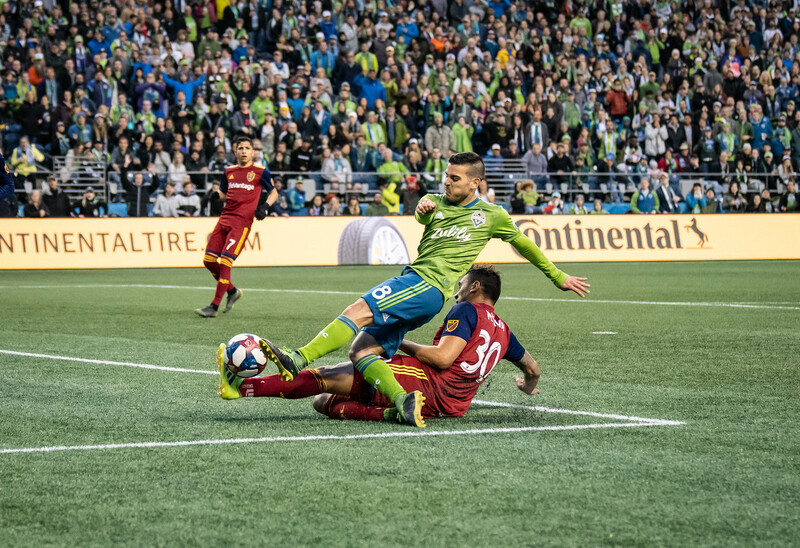 Just 4 minutes later, Cristian Roldan showed Bruce Arena and the USMNT exactly what they were missing and scored the Sounders 4th goal on the night and sunk DC United’s ship into the Puget Sound. 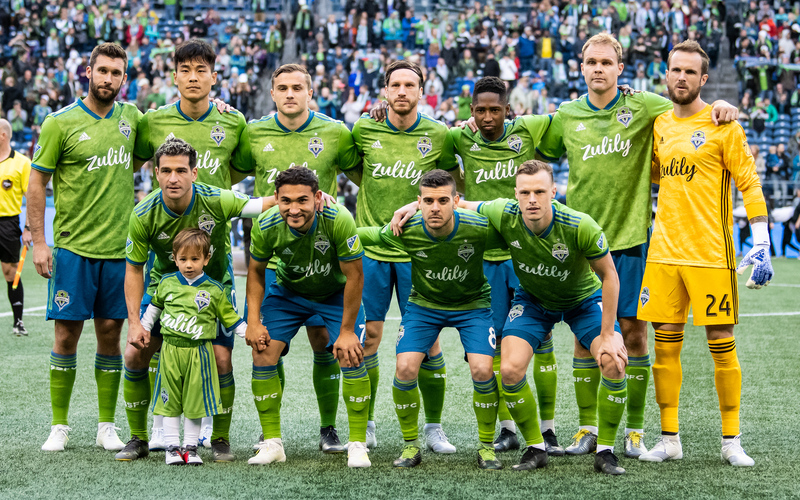 Unfortunately, Seattle’s party was spoiled a little by Nicolas Lodeiro being sent off in the 89th minute with a red card for violent content. 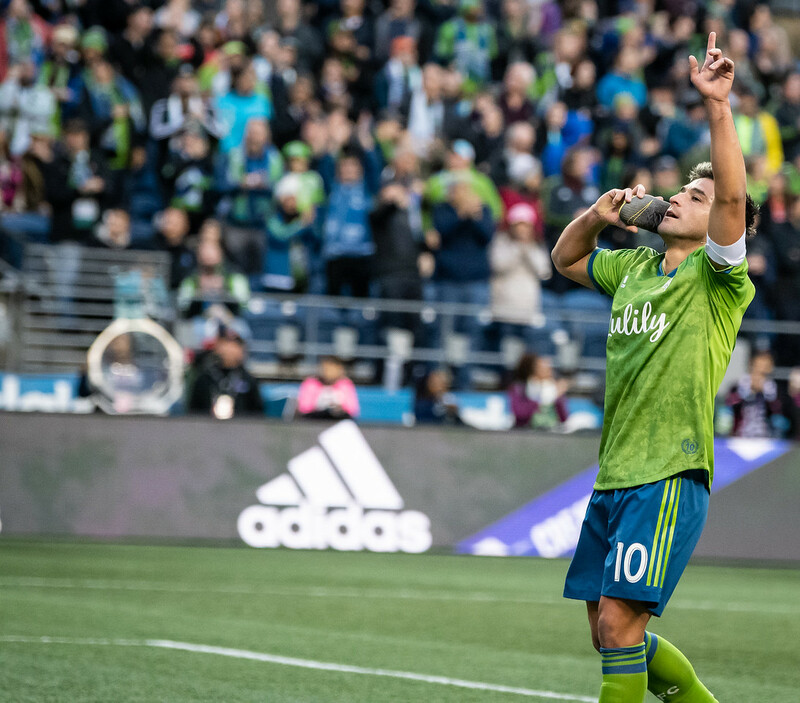 Lodeiro will miss the game against San Jose Earthquakes Sunday. It has been an insane couple weeks for the Seattle Sounders. Two weeks ago we had that miserable game in New York, then the Orlando game that felt like a loss with the goal in the dying minute of the game. Then we had the Portland game when we go down a goal, and a player, only to come back at the death – so a draw that feels like a win. We come to last Tuesday, the 4th of July game. Colorado Rapids have not been the same since last year when the Sounders faced them in the Western Conference Final. To start the night, Colorado was below us in the standings, both of us below the red line. The Sounders started the game short-handed. We only had 5 players on the bench due to international duty, injuries and suspension. I would love to have a full roster at some point during this season, but that is a discussion for another day. We have signed a new player but he is not eligible until July 10th. One would think this would be a horrible game, but actually, it was a great game… for the most part. The game starts fast, and the Sounders are moving the ball really well. It seems like they have actually made progress. This is a nice change of pace. In the 6’, Clint Dempsey scores an awesome goal with the assist coming from Jovein. From there, game goes downhill quick. In the 13 minute, Ozzie is taken down by a heavy challenge. He needs help off the field and is replaced by Kovar. It gets worse from there. In the 22nd minute, Chad Marshall goes down hard and has to come out, with an ankle injury. So even with having a goal lead and Colorado defense being less than stellar, I think all Sounder fans were really nervous. But the Sounders seem to fight even harder as the game goes on. Will Bruin gets a stunner of a goal in the 30th minute. We head into halftime up 2 – 0. The Sounders come out fighting in the second half. This has been the best the Sounders have looked in a long time. Maybe things are turning around. Kovar comes close to scoring. Of course, with our patched together defense, can’t stop everything. Colorado starts to push a lot and finally in the 78th minute they get a goal. Stefan Frei then has a save that might give The Save a run for its money. Finally, in the 85th minute, Dempsey scores an amazing goal that seals the game. Overall, this was a very good game. There were ups and downs but, finally, we come home with 3 points and we are back above the red line. I am really glad we have 2 weeks off so our players can heal and be ready for a push to the playoffs. The next game is Saturday, July 8 with a friendly against Eintracht Frankfurt. Next MLS game is July 19th at home against DC United.